In 2008 experts were able to use new - cutting-edge? 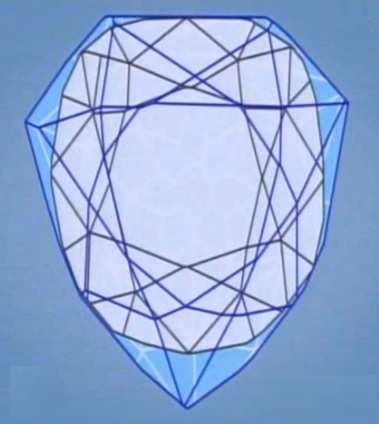 - digital technology to reconstruct accurately for the first time the appearance the lost French Blue diamond which was once part of the French Crown Jewels. The result was quite unexpected and provided an illuminating insight into the France of Louis XIV. At the same time new light was shed on the ultimate fate of the gem after its theft from the Garde-Meuble in 1792. The French Blue almost certainly originated from the Kollur mine in Golconda in India. It was sold to Louis XIV by Jean-Baptiste Tavernier in 1668 and recut by the court jeweller Jean Pitau between 1669 and 1672. In 1749 Louis XV had the stone reset as part of the great ceremonial insignia of the Order of the Golden Fleece (Toison d'Or). In 1787 the diamond was briefly removed from its setting by the physicist Mathurin-Jacques Brisson who investigated the specific gravity of various coloured diamonds. In 1792 it was among the gems stolen from the Garde-Meuble and never recovered. Germain Bapst, the 19th-century historian of the French Crown Jewels, concluded that one of the thieves, Cadet Guillot, left Paris with the Toison d'Or, from which he detached the French Blue and the Côte de Bretagne spinel (a red stone, cut into the shape of a dragon). The latter resurfaced in Hamberg in 1797 and was reintegrated into the Crown Jewels in 1824. 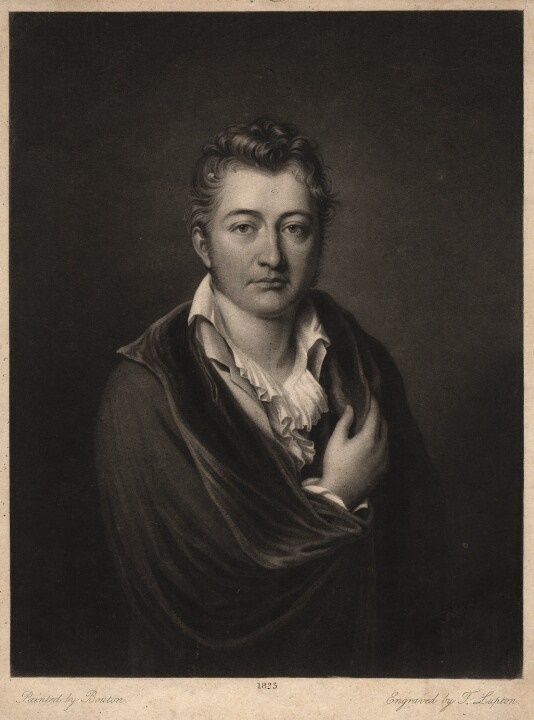 In 1812 the London Huguenot jeweller John Francillon reported that he had been invited to examine a fine deep blue diamond weighing 177 grains on behalf of the diamond merchant Daniel Eliason. 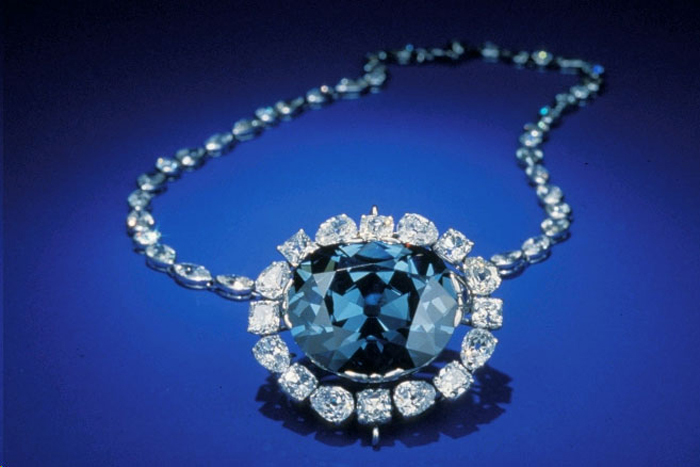 This stone, known today as the Hope Diamond, after its first known owner Henry Philip Hope (1774-1839), was in all probability cut from the French Blue. This diamond was listed in inventory of the Hope collection in 1839 and remained in the Hope family until 1901. It then passed through the hands of a number of dealers until in 1910 it was sold by Cartier to Mrs Evalyn Walsh McLean of Washington D.C. In 1949 it was bought by the jeweller Harry Winston who in 1958 donated to the Smithsonian. The new breakthrough in investigations came in December 2007 when Professor François Farges, Professor of Mineralogy at the Muséum National d'Histoire Naturelle in Paris discovered a lead replica of the French Blue in the MNHM collections. He invited Matrix Diamond Technology in Antwerp to produce a 3D imagining model comparable to one which had been made of the Hope Diamond in 2005. The renowned gem replicator Scott Sucher, from New Mexico, who had been involved with the 2005 project, analysed the new scans. Sucher had to painstakingly remove the flaws to uncover the seventy-eight facets that made up the stone. Farges then commissioned Sucher to make a precise replica from cubic zirconia (CZ). They were now in a position to confirm that the Hope Diamond had indeed been cut from the French Blue. The blue diamond reclaims its place as the masterpiece of Baroque lapidary art, thanks to its seven-fold symmetry, which was extremely complex to cut. Almost forgotten since its theft in 1792, the diamond features a central "rose" which shines like a sun. Was this a symbol desired by the sun-king himself? He concluded that the piece was not intended to worn but to be placed on display to impress foreign diplomats with the wealth and power of France. It is not quite as spectacular as taking the DNA from the blood of a mosquito and creating a dinosaur I mean it is not like we are going to make Jurassic Park out of this, but on the other hand we have used modern technology to bring back the history of a diamond that no one has seen since 1792. We are putting ourselves back into the eyes of Louis XIV to see what he saw. We are bringing that diamond back out of history here to today. 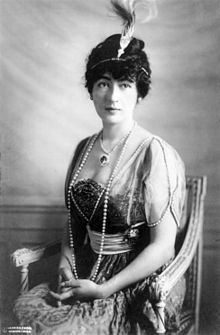 The discovery of the lead cast strengthens the conclusion that the stolen French Blue was indeed taken to London where it was cut down into the Hope Diamond. The implication is clear: Henry Philip Hope must once have owned the French Blue. If so, then it was Hope himself who had the Hope Diamond cut. 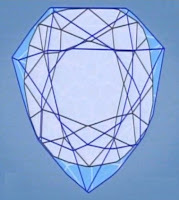 In Scott Sucher's view the intention was definitely to disguise the diamond, with certain facets offset, so as to make the colour appear darker. To an extent it all fits: Hope was one of Achard père's best customers, so he ought to have been well informed. However, there are still a few problems:. 1. The text by John Francillon suggests that in 1812 the Hope Diamond was in the custody of the diamond merchant Daniel Eliason. Hope may have been trying to sell the diamond at the time, but it seems more natural to assume that he acquired it subsequently. 2. Can the diamond of "remarkable clarity" referred to in the catalogue really be the French Blue? It would have been a lot more more natural to remark on its blueness, its triangular cut or its enormous size. 3. Achard (or the subsequent cataloguer) would surely have recognised a cast of the French Blue, so why draw attention to Hope's ownership of a stolen jewel? Myself, I think the jury is still out on Hope's culpability. 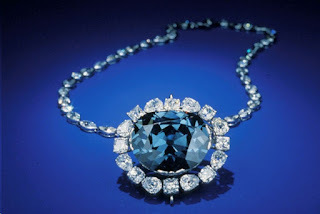 MNMN, Dossier: "Le spectre du diamant bleu de Louis XIV"
Professor Farge's discoveries were the subject of an Arte documentary by Thierry Piantanida, broadcast in April 2011 [see clip above], English version produced by National Geographic as "The Secret of the Hope Diamond". The latter is available as a dvd. The older documentary from the Smithsonian Channel, "Mystery of the Hope Diamond" (2010) has all the background (and Lucy Worsley). 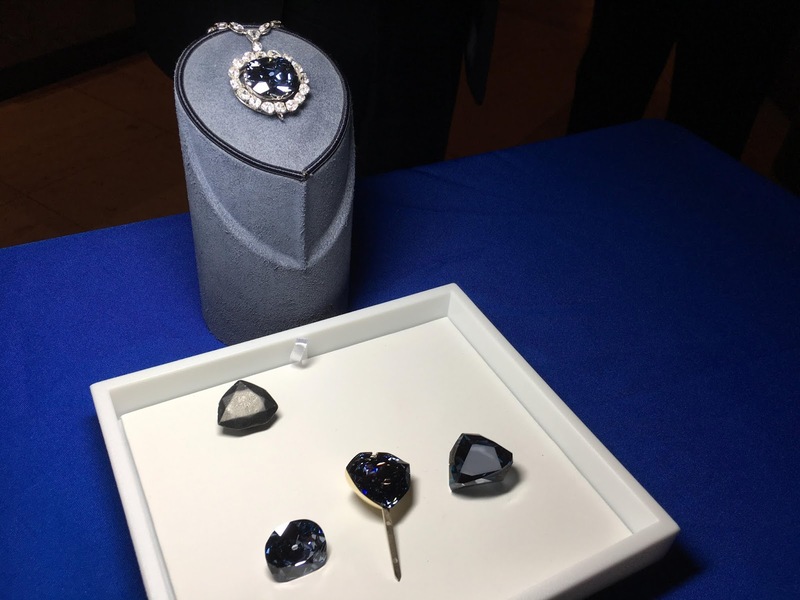 Replicas of Tavernier's original diamond, of the French Blue and the Hope Diamond. Created by John Hatleberg of New York and unveiled at the Smithsonian in October 2017. On show here with the real Hope Diamond.